I had you up until I mentioned the thyme, right? I know, I know. It sounds a little weird. Buuuut it’s really good, in a weird sorta herby popsicle way. And my 3 year old agrees. She often declares, “Mom! These are the BEST popsicles evaaaa! 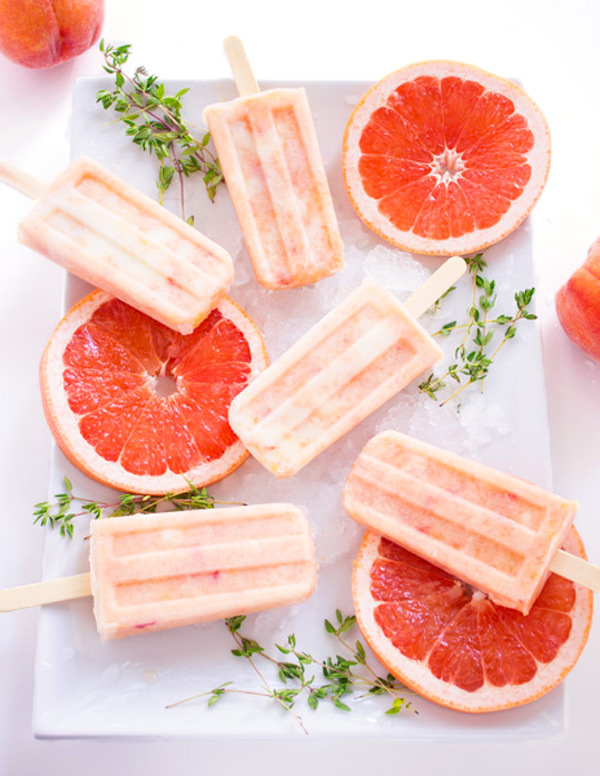 !” while we soak up the rays outside with our goats and chomp on one of these grapefruit peach pops with maple and thyme. Yes, I have goats. 2 Nigerian dwarf goats to be exact. I can’t believe I haven’t shared stories about these goat babies with you yet. They’re awesome. One likes to jump up on my lap and cuddle. The other knows how to go down a kiddy slide. True story. Cats and dogs are sooo yesterday. Ok, maybe not. I have a dog too. And she’s also pretty great even though she doesn’t go down kiddy slides. Goat and dog tangent finished. Back to these popsicles. So did you guys know that thyme pairs really well with grapefruit?! 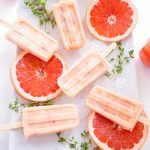 This thyme in my popsicle craziness was prompted by the grapefruit kick I’ve kinda been on lately (check out this salad for another tasty recipe involving grapefruit). My 3 year old gobbles up whole grapefruits (minus the skin and seeds of course) like its no ones bizness. It’s kinda crazy how much the little girlie loves grapefruit. 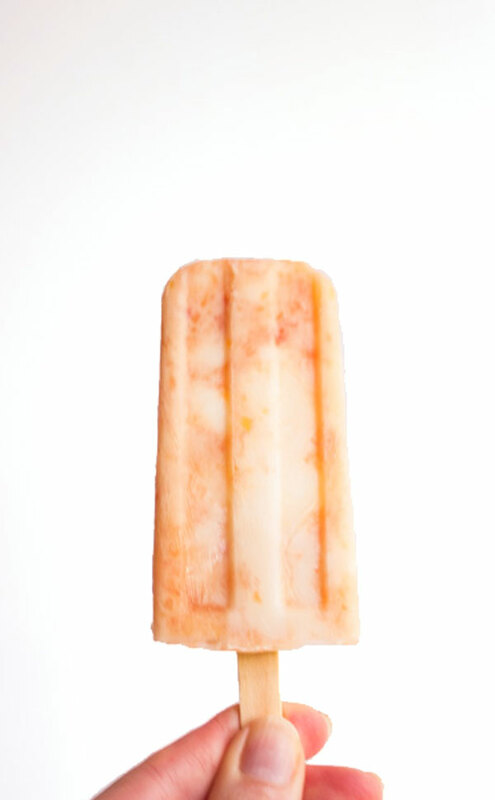 So it only made sense to transform her favorite fruit into popsicle form during these hot summa days. But because her mama likes to tinker with flavors and food and couldn’t just settle for plain ‘ole grapefruit popsicles, I got a little cray cray and threw in the peach with some thyme infused maple syrup. Then I later found out that it’s actually not uncommon for grapefruit and thyme to be paired together in a cocktail. Who knew?!! Apparently I didn’t. I’m definitely not educated in the whole cocktail combination scene. 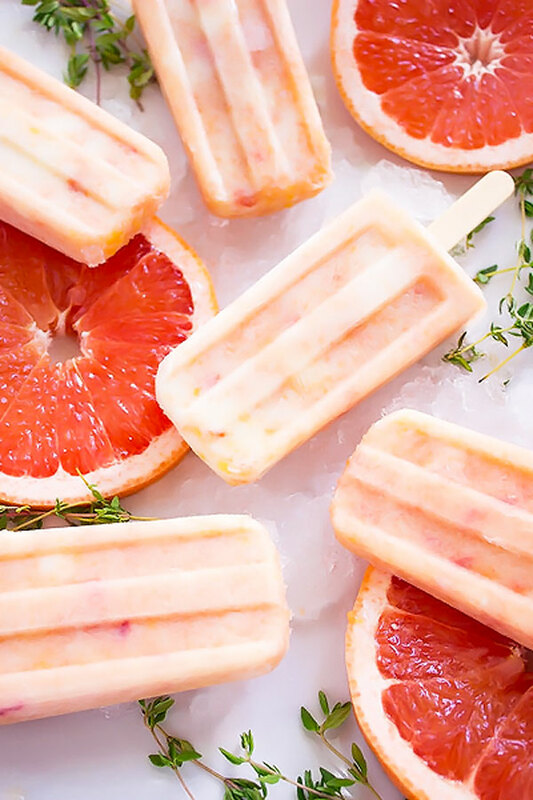 Keep cool with these summery and refreshing popsicles featuring pink grapefruit, sweet peaches, and yogurt combined with a thyme infused maple syrup. In a small saucepan combine maple syrup and sprigs of fresh thyme. Bring to a simmer over medium heat, and cook for about 5 minutes. Remove the pan from the heat and allow the thyme to steep in the syrup for about 10 minutes. Strain the thyme and set the syrup aside until slightly cooled. Cut both grapefruits in half horizontally and then squeeze all of the juice and pulp into a large mixing bowl. Remove any membranes, pith, or seeds that may get in the mix. In a food processor, process the grapefruit juice and pulp with the peach slices until it reaches a consistency that you like. I left mine slightly chunky because I like having small bits of frozen grapefruit and peach in the popsicle rather than completely pureed. In a bowl combine the maple syrup and processed fruit. Then add the yogurt and gently mix to desired consistency. 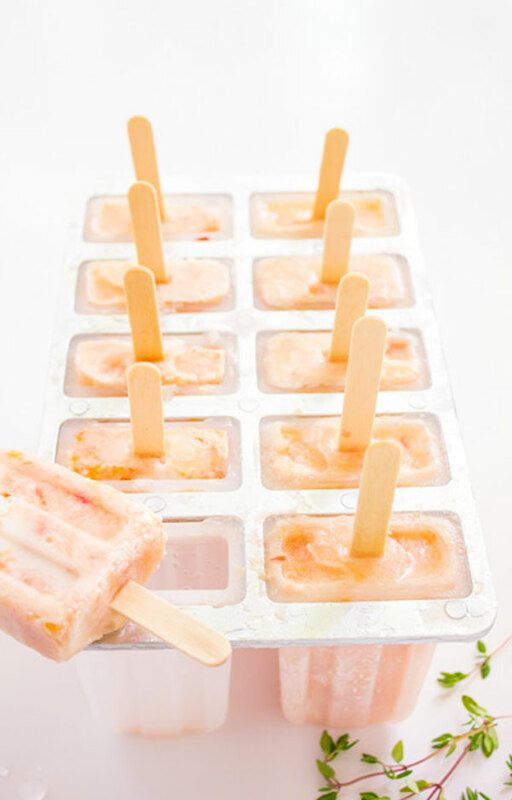 If you want a marbly look to your popsicles– do not fully blend the yogurt and fruit. Give the mixture a little taste. If you would like it sweeter, you can add a little more maple syrup. Pour mixture evenly into each popsicle mold. If your popsicle mold has slots for sticks, you can insert them before freezing – if not, freeze for 2 hours before inserting the wooden popsicle stick. Continue to freeze for an additional 4 hours. Run popsicle molds under warm water to easily remove. Eat and enjoy! Hey Shannon! Made these popsicles, they are so refreshing and yummy! My kids liked them too! I will definitely be making them again this summer! Interesting combination of flavors! Beautiful pictures, too. They look really good! Thanks Dee! I hope you get a chance to make them and try them out!